Here's an eyesore made into a photo op. This ugly storage shed was in the yard where I had my wedding. 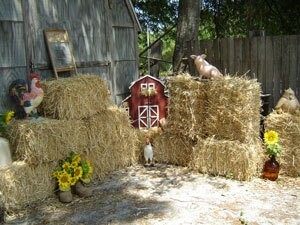 With some hay bales, country collectibles, and fresh cut sunflowers I had a great background for pictures. It tied in just right with my country wedding theme too! Nice work! good enough for a wedding day. What a great idea. A very nice setting for a wedding that is one of a kind. Well, it was until you posted that picture, now alot of girls will want to try it. Very nice and creative! Great idea and very pretty, too!